Clothes: Wearing 12-18 months size, but I see a lot of strictly diaper-time now that the warm weather is here! Eating: He's still nursing all day & all night! We also continue to introduce new foods as well as whatever we are eating at each meal. He is slowly starting to actually ingest more foods but still prefers to just chew on and play with it most of the time. This month's favorite: greek yogurt! We preload it onto a spoon for him and let him feed himself; he absolutely loves it! Since yogurt is relatively thick, it doesn't fly off the spoon too easily! Diapering: Only cloth on our sweet baby's bottom! I also took the plunge and bought a wool cover for night time! Promise to do an updated cloth diapering post that will hopefully answer some of the questions I've been getting. Adventures: We made a trip to Spokane for Liam's baptism! You can read about our visit here. We've also continued to take many trips to the park & zoo with all the nice weather we've been having! 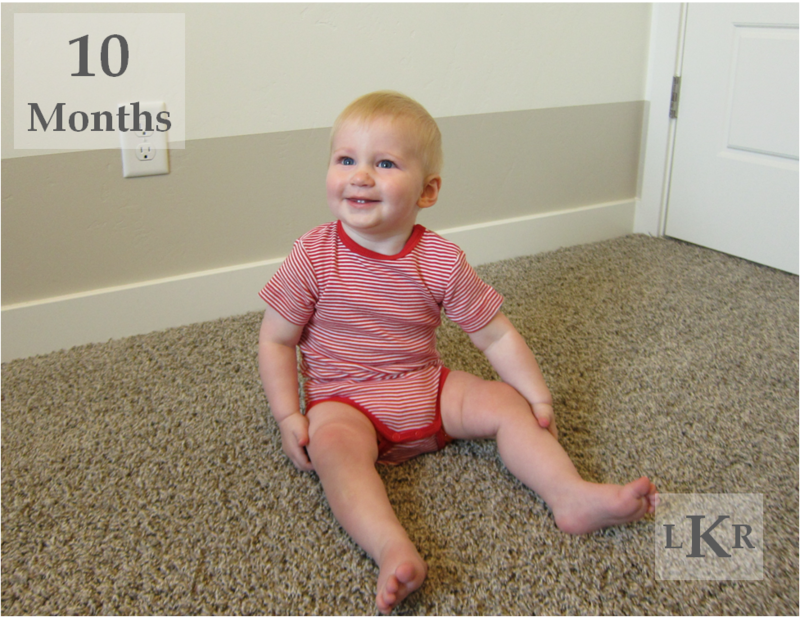 Milestones: Little L has mastered the stairs! Not more than 2 weeks after he started crawling he was going up our stairs any opportunity he got! Now that he is mobile, it seems like everything is happening so quickly. Too quickly! He's even starting to stand alone for a few seconds at a time now, eek! I have to say, he may be walking by next month...we shall see. In not-nearly-as-exciting news, Liam figured out how to drink from a straw this month! No drink is safe from his little hands now! He'll swipe anything right from your hands! Also, one of his top teeth came in, so the total is up to 3 little chompers! Aw, such a little ham!!! My little lady will turn ten months on Sunday!